Max does it again but this time with more color and incredible new projects. 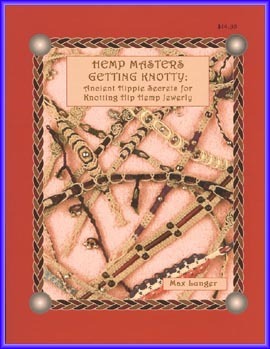 His new book is a simple, easy to follow instructional guide to creating outstanding hemp jewelry. And as the author says, If you enjoy doing something, you do it well. If you enjoy learning something, you learn it well. This book has an abundance of illustrations and photographs to complement the clear, comprehensive instructions. The introduction has definitions of terms used in the book (knotting and hippie lingo), hemp facts everyone should know and a hippie history poem. How To Begin details deciding how long to cut the hemp for a particular project and how to start tying a piece of hemp jewelry. There is also a section of Helpful Hints and Hippie Secrets for working with and knotting hemp cords. The Knotting Guide explains all of the knots and variations. Finally, there are 22 example projects, from the simple to the complex, all beautiful, with pictures and instructions for each.